The 7.8 magnitude earthquake two minutes after midnight, on Monday 14 November, shook central New Zealand intensely and was felt widely across much of the country. With the quake’s epicentre about 15kms north-east of Culverden and 60kms south-east of Kaikōura none felt it more strongly than people in North Canterbury and the South Island’s northern east-coast communities including Kaikōura, Seddon, Ward, and Clarence. Sadly, there were two deaths in Kaikōura and Mount Lyford. Widespread damage to buildings also occurred in central Wellington and severe weather the next day further disturbed many in the region. St Theresa’s Parish Plimmerton experienced extreme flooding. Our prayers go out to all affected. 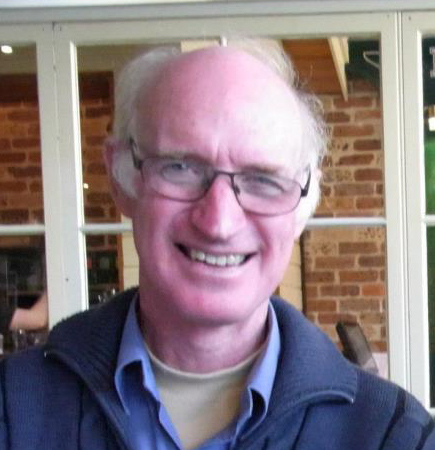 Fr Pat McIndoe, parish priest of Te Whetu o Te Moana – Star of the Sea Marlborough Parish, which includes Kaikōura and Marlborough areas, visited his people in Seddon and Ward in the days following the earthquake. He was in Kaikōura by the end of the week where he stayed for the remainder of November offering pastoral support to the communities. 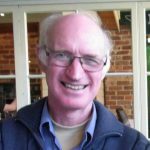 Fr Pat McIndoe shares his stories from Kaikōura and other affected communities. 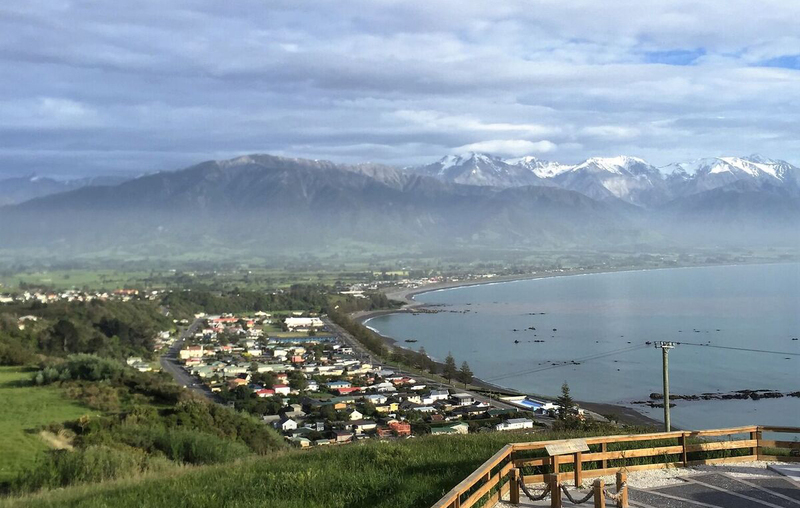 Many of you would have had the opportunity perhaps to visit Kaikōura at one time or another. It is a quiet little town set against the beautiful backdrop of snow topped mountains and the cold blue of the Pacific Ocean. Now people of the community are shaken with their lives severely disrupted by the 7.8 earthquake which came at two minutes past midnight on Monday 14 November. In Kaikōura, Ken and Mary Smith whose two-storey house by the beach was badly damaged in the quake said, ‘It felt like two big quakes hard on top of each other. The first one lifted up, and the second moved violently to the side’.Ken said, ‘You can see that by the way the coastal reef and sea-bed has lifted up two metres and more in places and exposed rocks and sea-bed that were once hidden’. Ken and Mary showed me how a brick wall had collapsed at the back of the house and other parts of the house were clearly damaged. Their home was now red-stickered. They are able to live in a nearby house that was little affected with the owner’s permission, who is in Christchurch. I arrived by small Cessna from Blenheim on Friday 18 November after flying above the coastal road, which was cut in several places by slips – one or two were massive and will be very difficult and dangerous to clear. I had already visited Seddon and Ward on Wednesday and spoken to people whose houses in these farming communities had been badly shaken up. Some had almost every bit of crockery and item on shelves including toasters and microwave tossed in a heap on the floor. When I rang parishioners Tom and Aileen Hickman, they had left to stay at Nelson with their grandchildren – their house was so trashed. Their two sons had stayed on at Ward to try and fix the water pipes that were absolutely necessary to provide water for the farm stock. The water pipes had been sheared off by the massive quake, and John and Nick were trying hard to repair the pump and pipes. While I write this from the presbytery at Kaikōura, we are still getting aftershocks. You can imagine how unsettling it is, and several of these are quite strong. Yet I have been in awe by the strong spirit and pooling together evident in the community. On Sunday morning 20 November, on the Feast of Christ the King, all Christians and others of no faith, came together in Churchill Park for a large ecumenical service on the grass for everyone. 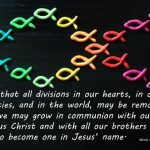 Following an idea of Rev Alastair McNaughton, the Presbyterian minister, we all gathered in song and prayer to thank God for our deliverance, and to pray for those who were injured or grieving. Rev Kevin Topp, the Anglican minister introduced his prayer for the Kaikōura community by telling two stories. One was of a young man who was severely shaken from his bed by the earthquake in the dark of the night. He ran outside and would not return to the house until the light of morning. When he looked into his bedroom, he saw to his horror and amazement two cement blocks from above had dislodged and were sitting precariously just above where his head had been on the pillow. 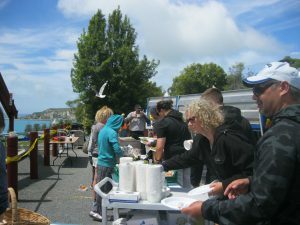 Kaikōura community spirit pooling together. The other story was of an older lady. She had never really taken to using a mobile phone. Her family had given her one, but she rarely used it. The morning, after the terrifying earthquake had knocked the stuffing out of her and her house where she lived alone, she heard her phone ring. She lifted it up to hear her daughter tell her to go to the primary school to receive a parcel. She could barely hear the message. 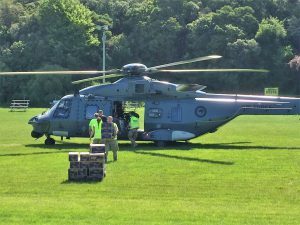 She went to the school as instructed and there, a helicopter landed and she was given a big parcel of groceries and food sent by her family in Dunedin. 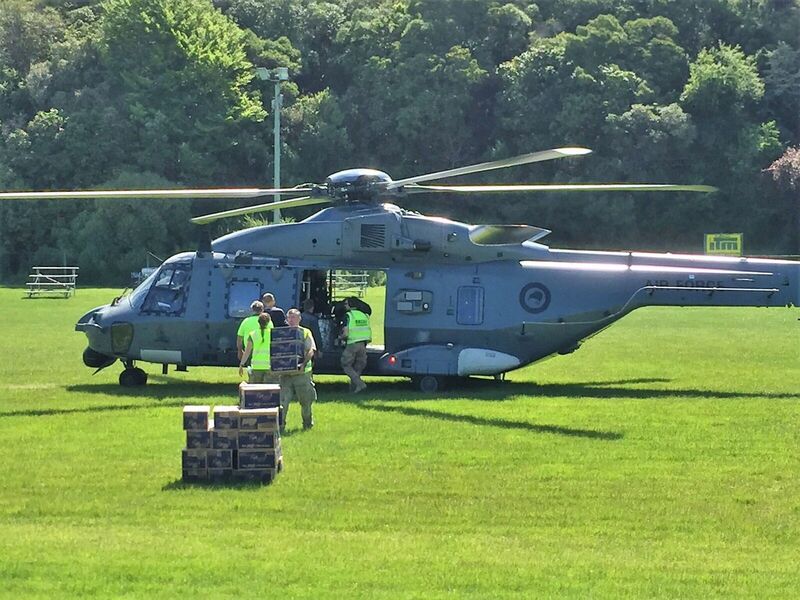 And wait for it – the helicopter pilot who delivered the parcel with a broad smile was none other than Ritchie McCaw! Kaikōura is still hanging on. The Civil Defence, the Red Cross, the NZ Defence Force and Police as well as Ngai Tahu and local Māori iwi have put up a wonderful effort to support and help those affected, whether they be local inhabitants, or the tourists and visitors who had their holidays unexpectedly disrupted. 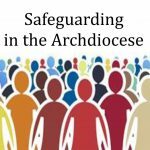 Yet I have been very impressed by the spirit of the people, including our own Catholic people who are embedded in the wider community and who had shown great resilience, courage and spirit especially in reaching out to support one another. 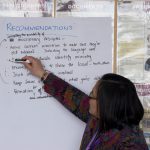 The local Māori community including a number of Catholics have shown a remarkable generosity and hospitality in welcoming all comers for meals at the Takahanga Marae, sometimes feeding as many as 800 people a day! At the service in Churchill Park, the Rev Chaplain Zane Elliot of the NZ Defence Force preached an eloquent application of the parable of the Good Samaritan. He urged us all to reach out to everyone who needs help regardless of colour, creed or place of origin. 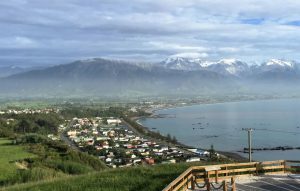 On Sunday 13 November WelCom’s Advertising Manager Ray Byrne and his wife Joan were driving to Wanaka from Wellington and stopped overnight at Kaikōura to break their journey – with no idea of what lay ahead. Just after midnight, on Monday 14 November I experienced my worst natural disaster. From a deep sleep I was suddenly wakened by the combined sounds of glass and crockery smashing, twisting and wrenching of walls and ceilings and an incredible amount of physical movement which continued for many minutes. The effect of all this activity amplified by the very loud background noise of the ocean was in a word, terrifying! We had arrived at our motel late on Sunday night. After the earthquake struck, when the transistor announced the possibility of a tsunami, we quickly gathered the owner of the motel and drove cautiously to high ground on SH1 alongside the hospital unaware that area would be our ‘home’ for the next couple of days. As Monday morning unfolded and we saw the physical damage around us we became slowly more aware of how lucky we were to be alive. Mobile phone communications were extremely limited but, with the help of others, after some hours we were able to contact one of our family members to let them know we were safe. Eventually we found our way from a Red Cross station, which quickly had been established in a highway service depot to the Takahanga Marae. Realising our good fortune to be ‘at home on the mainland’ we began helping to assist people – mostly overseas tourists – register for accommodation, note medical needs and offer reassurance they would be safe and help was on the way. No small task given our own uncertainty. Helping provide drinking water and food amidst so much uncertainty was a humbling experience, reinforcing for me the deep value of a smile and the simple act of being present to someone. 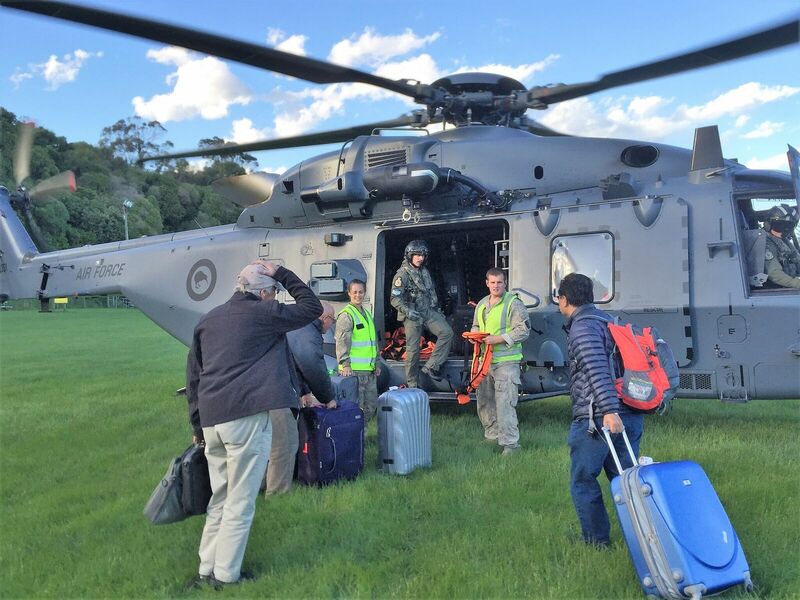 On Tuesday morning when the Defence Force evacuation programme was in full swing, my wife Joan became part of a small team prioritising people and families to fly out in the NH 90 helicopters. Looking back, the generosity of local Māori at Takahanga Marae in immediately providing shelter and feeding over 1000 people was exceptional. Many local residents who themselves have suffered much hardship with power and water supplies broken also helped as volunteers, gathering and distributing food. At such time, the power of God’s love is inescapable in the ways people look out in concern for those around them. I hold high the actions of so many and pray the country will support the local people as they rebuild their homes and livelihoods. May they be thanked by the continuing support of us all in the months and years ahead.